Sawn timber with sharp arrises (edges); in case of pieces longer than 3m, wane less than 10% of the face width is permitted across no more than 25% of the length. Sound sapwood permitted on two arrises if the total width is less than 15% of the face width. Fully or partly intergrown sound knots are permitted if the diameter is less than one third of the face width. Dead knots, permitted where equivalent to two dead knots with a diameter less than 15mm per linear metre. Boxed heart permitted, as well as slight traces of heartwood on two faces. Slope of the grain less than 7%, not exceeding 12% locally. 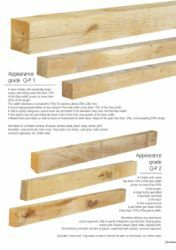 Sawn timber with practically sharp arrises, permitting wane less than 10% of the face width across no more than 30% of the length. This width tolerance is increased to 15% for sections above 250 x 250mm. Fully or partly intergrown sound knots are permitted if the diameter is less than half the face width. Boxed heart permitted, as well as traces of heartwood on both faces. Slope of the grain less than 12%, not exceeding 20% locally. Permitted on a limited number of pieces: brown streak, black holes, brown pith. Excluded: unsound knots, frost crack, ring shake, star shake, curly grain, bark pocket, unsound sapwood, rot, white holes.